During Pride month one city offers a unique opportunity for LGBT athletes to celebrate the spirit of competition by playing the sport they love – flag football. The annual Pride Bowl tournament began in 2008 when the Chicago Metropolitan Sports Association (CMSA) introduced flag football to the Pride month calendar. 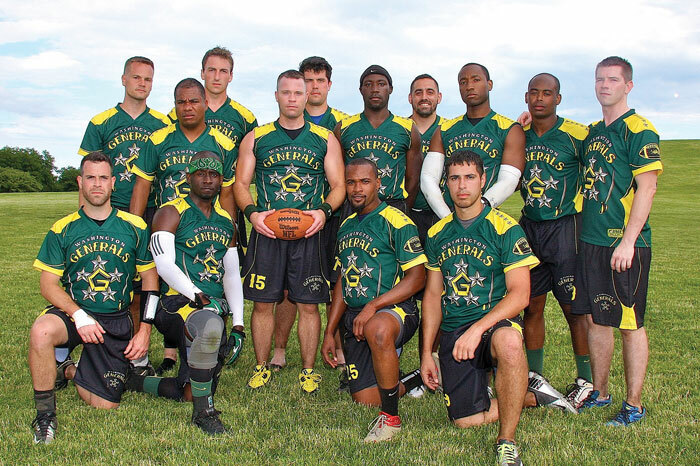 On June 24-25 nine football fields near the Chicago lakefront will serve as the backdrop to this year’s contest. The CMSA will host the largest Pride Bowl in its nine-year history, including 34 teams competing in their respective divisions – Open A, Open B, and new to this year’s lineup, a women’s division. For two consecutive years players, volunteers, referees and fans have gathered to view the A division title game between the Washington Generals and Cleveland Rockers. And for both years the Generals have carried the trophy off the field. Brandon Waggoner, captain of the two-time defending Pride Bowl champion Generals said that “Chicago is an amazing tournament that is well run. Competition levels are perfectly aligned and I like the timing of it being halfway during the season, leading up to the national Gay Bowl in October.” Chances are we will witness an all-D.C. dual in the final game this year due to a rise in the ranks of the D.C. Admirals who finished in second place during last year’s national tournament. The B division has continued to drift out of the shadow of the A division. Last year’s championship game provided proof that the B division is no longer viewed as the little brother in the annual competition. Teams in the B division certainly can stand alone and claim their own light. Former upper division team, the Houston Hurricanes traded divisions and faced the up-and-coming Denver Summit Orange team. Houston walked away with bragging rights after a tough, hard-fought game. But just three months later the Summit would avenge its defeat and claim the top spot on the Gay Bowl National Champion podium. With the past two years of growth and a majority of their starting lineup from the past two tournaments intact, Summit Orange walks onto the field in Chicago on the 24th highly favored to win its first Pride Bowl title. Over the past four years the National Gay Flag Football League women’s division has seen tremendous growth that includes a growing thirst to compete in Pride Bowl. Chicago’s rich history of female competition in flag football runs deep and assures a competitive two days of football. Six teams will participate in the Pride Bowl’s inaugural women’s division play, including a team from the Mile High city of Denver that has proved its dominance. The Denver Gay and Lesbian Flag Football League has provided a Women’s National Gay Bowl champion every Gay Bowl since 2012. Will home field advantage provide Chicago with the opportunity to finally knock a Denver team out of the top spot? That’s been the big question for everyone in the weeks leading up to this highly anticipated women’s division play.